A Jaki (a traditional mat) can be made of various natural fibers prepared following ancestral methods. Maan̄ is the long thin leaf of the pandanus tree. All mats, traditional clothing, many types of baskets, thatch for housing, and more recently, many types of hand-crafts are made with maan̄. 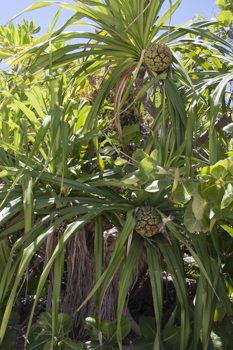 There are several types of pandanus trees in the Marshalls and only the leaves from certain types are used for making maan̄. Basically two ways of preparing the maan̄ for weaving can be commonly seen in the Marshalls today. This type of maan̄ is made from the dry leaves that are still hanging from the tree. They are gathered, and both ends of the leaves, plus the thorns on the edges and down the middle of the back of each leaf are cut off. Then each individual leaf is smoothed and straightened out by pulling it between the fingers. Next each leaf is softened by rolling the leaf back and forth into a circular shape and pressing down on it with the hands until it is pliable. This is called jāljel. If the leaf is still stiff it can be pounded with a dekenin until softer. 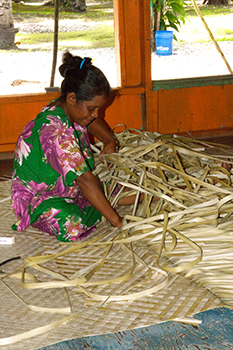 If desired the leaf is then cut into strips for the desired width, and is ready for weaving. Maan̄bil is almost always used to make the tōlao (sitting mat) and today is becoming very popular for making hand-crafts. This leaf is a tannish-brown shade. This type is made from the green leaves of the pandanus tree. The leaves are cut from the tree, and then the ends of the leaves and thorns are cut off from each leaf. There are two ways of drying the leaf. They can be simply left in the sun to dry, turning the leaves often. This may take several days and the leaves will turn a light tan shade (lighter than maan̄bil), or they can be held over the coals of a fire. When cooking the leaves, each is placed across the coals on a pāp (midrib of a coconut frond) and constantly moved back and forth until it is very soft. This process of cooking the leaf is called erar. Then the leaves are placed in the sun and turned over often to continue the drying process. When they are dry they will be an off-white shade. This process produces the lightest color of maan̄. Then each leaf is straightened and rolled and pounded as mentioned for maan̄bil. After each leaf has been jāljel it can be stored. Beginning with one leaf it is rolled around the former leaf until a large circle of leaves has been rolled together. This is called a daln̄on or jāljel in maan̄ and is used as a means of storing and protecting the maan̄. Maan̄ can be stored for a very long time this way, for as long as it is protected from insects and moisture. The daln̄on are often put in the sun to make sure the leaves are dry and do not mildew. As mentioned before, the leaves are pounded with a dekenin to soften them and make them pliable. This is done by placing a large smooth rock slightly in the ground (so it won’t move) covering it with a piece of cloth or mat, placing two or three leaves on the mat and pounding them with a dekenin. The leaves are folded over and pounded on all sides. All leaves are very thoroughly pounded. Maan̄ which has not been pounded is called maan̄ pinju, but only the tōlao and recent hand-crafts such as baskets, are made from this type. The jan̄in̄i, jepko, and other types of jakis (mats) are always made from maan̄ which has been thoroughly pounded with a dekenin. Next, each leaf is cut into long strips of the desired width. This is called iie. The instrument used today is called ar and is made from wood with metal spikes attached to cut the leaf. This instrument can cut one leaf into several strips with one stroke the length of the leaf. Before metal was introduced to the Marshalls the remaining skeleton of the jebar (sea animal) was used. The word ar comes from the name of the lines in each leaf. The ar (lines) are used to determine the width of the strips. For Example the nieded (traditional mat clothing) was woven only from maan̄ that was three ar wide. Thus it was a very small weave. These lines can be easily seen in any maan̄. Today most women weave on the ground using a piece of plywood underneath or in a house with a wood or hard smooth floor. This enables the weaver to keep the weaving straight and the ends of the mat even. Before there were large flat pieces of wood in the Marshalls, women began the weaving of a mat by placing a mōnakjān in wōjlā on their laps and then weaving on top of it. In starting a mat the mōnakjān helped keep the weaving even. Then it was removed and the women would simply weave on their laps. The women of today who only know how to weave on the ground say that the women of long ago were better weavers for they could weave evenly while weaving on their laps. This is one of the most important possessions of a Marshallese. Usually the dekenin is passed down from one generation to the next. Most of the ones being used today are already three or four generations old. They are used to pound the maan̄ to make it pliable and soft for weaving. Although they are seldom made any more, the older people still know how to make them and they are still commonly used on all islands. There are basically two kinds: one type made from a hard type of rock, and the other made from the kapwor (giant clam shell). The first type is made from bar which is a hard coral rock found on the reef. The bar can only be found on certain islands, so, often Marshallese would have to sail to other atolls to obtain it. It is carved, shaped and smoothed into the dekenin by using a coral rock that is found in the ocean. This coral animal is red and its skeleton turns black and very hard when dead. It is called limlim. The tilaan (pumice rock) is used for the final smoothing of the dekenin. This type of dekenin is common but is not as heavy, strong, or effective as the type made from kapwor. Kapwor is also only found on certain islands. The kapwor is broken up by hitting it with rocks until the desired size of a piece of it is obtained. 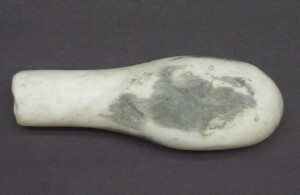 The thick part of the kapwor where the two bivalves are connected is the part needed to make a dekenin. It is also carved and shaped with the use of a limlim and the surface smoothed with a tilaan. This type of dekenin is very heavy and strong, and lasts for a much longer time than the bar type. Many older people of today still know how to make these, although they would be made with the use of more modern tools than have been described above. The jan̄in̄i, jepko, new jejaki and nieded are always made from pounded maan̄ whether it be maan̄bil or maan̄rar. The tōlao is usually made from maan̄bil that has not been pounded. Detail of a belt to tie the clothing mats around the body; The outer layer of the belt is weaved from hibiscus fiber. This is a material used for weaving to add color to mats. Originally the in (grass skirt) was made from this. Jab is made from the tree called lo which is a hibiscus type plant. It is made from the small, new trunks of trees. A trunk is found which has no side branches and is cut down. Next the outside layer of the skin is scraped off (brownish-green part) until the wood is white in color. Then this trunk is buried in the sand near the high water mark in the lagoon where water will wash over it, and is left for about a week. The washing loosens the skin, and makes it easy to remove from the inside bark. When the trunk is removed from the sand, the sand is washed off and the skin is pulled off and dried in the sun. It is usually a whitish or tan color. This process produces long, very thick strands of jab. When jab is woven in a mat or other products it is almost always woven with maan̄ underneath it to protect it, for it can tear easily. To dye the jab first mālle in bweo coals (burned coconut shells) are mixed in water and stirred until the color is even. To seal the black coloring, so it won’t rub off, jon̄ is added to the water. This is made from the fruit of the jon̄ tree (a type of mangrove tree). To make this, the fruit is cut into very small pieces, and a small amount of water is added and mixed with the fruit. The resulting juice of the mixture is strained off and added to the black mixture. Next a piece of inpel (coconut cloth) is dipped into the mixture and is used for painting the color on to the jab. Then the blackened jab is dried and ready for weaving. The coloring will be permanent because of the jon̄. The original type in was usually made from blackened jab, and in almost all nieded the border design was produced by using jab. 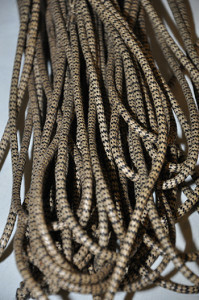 Another weaving product used by the Marshallese traditionally is made from the skin of a vine plant. To make this, first long stems of the vine are cut off. All leaves are removed from the stems. Next the thick skin of the stem is peeled off. Then the thin transparent skin is peeled from the thicker part of the skin. The very thin whitish color skin is the atat. This is dried in the sun and will become a reddish-brown color when dry. To store atat, one long strip is folded, and then another is added around it until all are folded in this matter. This is called dridrib. The jab is also stored in the same manner. Atat is woven with maan̄ or kimej underneath it because it is very thin and easily torn. It is seldom dyed, but is used in weaving mats, the in, and many recent hand-crafts of today when a reddish-brown color is desired.